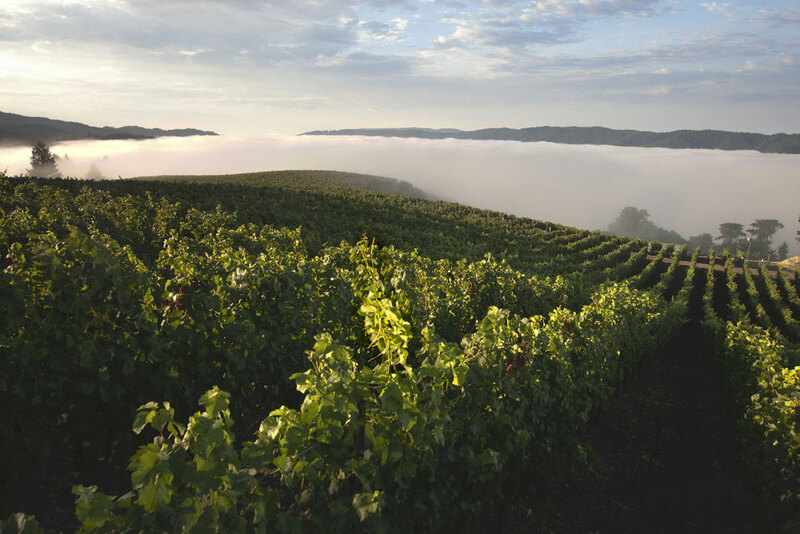 Welcome to the Fall 2012 newsletter from Rhys Vineyards! In addition to our first 2010 Pinot Noir, this very exciting offering features all three of the wines produced by Rhys’s Horseshoe vineyard from the 2009 vintage. Although still quite young, this beautiful vineyard has already proven to be one our very finest sites. 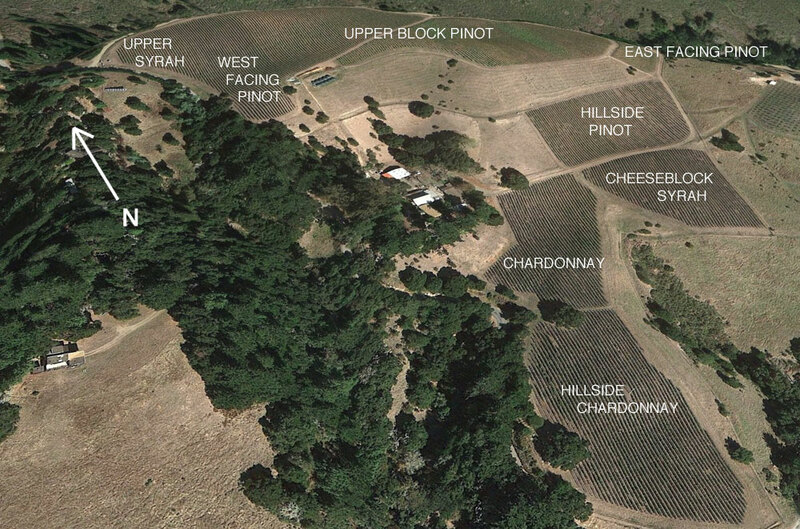 A view of the Horseshoe from the east shows Chardonnay in the two leftmost blocks, Syrah in the center foreground, then the hillside, east facing and upper pinot blocks above and right. The San Mateo Pinot is back! It has been several years since we released the extremely popular 2006 Alesia San Mateo Pinot, and we feel this 2010 bottling is a more than worthy successor. After careful evaluation, in many vintages we find that some barrels of estate Pinot Noir do not fit in their vineyard designated bottling. We use these barrels to produce a less expensive and often earlier drinking appellation (rather than vineyard) designated wine. In 2010, we blended barrels from Alpine, Horseshoe and Family Farm vineyards in order to create an intensely aromatic, spicy, elegant and balanced 2010 Rhys San Mateo Pinot Noir. This breathtakingly beautiful site, originally called Horseshoe Ranch, was used to range horses and livestock for decades prior to our purchase in 2004. Given the close proximity to Alpine Vineyard (Horseshoe lies just 500 yards to the east) we often think of Horseshoe and Alpine as sibling vineyards and two of the real jewels in the Rhys portfolio. 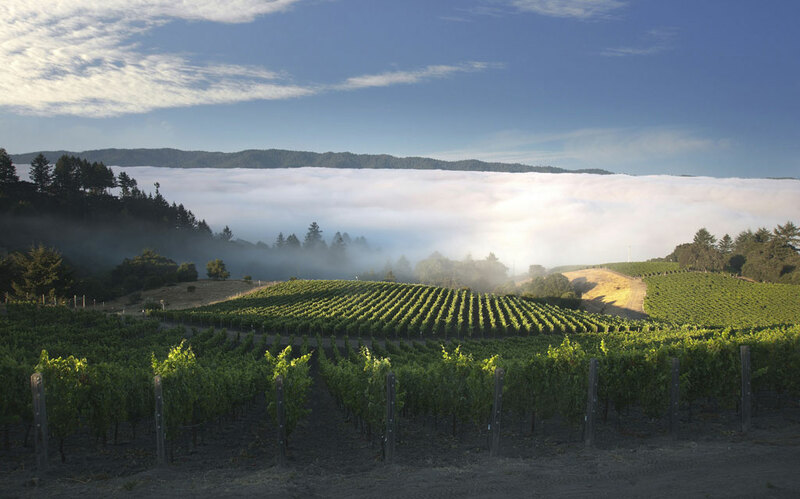 While the two vineyards share the same cool, challenging climate, there are many geologic differences that cause the sites to produce very different wines. Horseshoe’s most defining feature is its intensely rocky soil. In contrast to Alpine’s soft, chalky Purisima formation, Horseshoe sits on bed of brittle sedimentary Monterey shale. 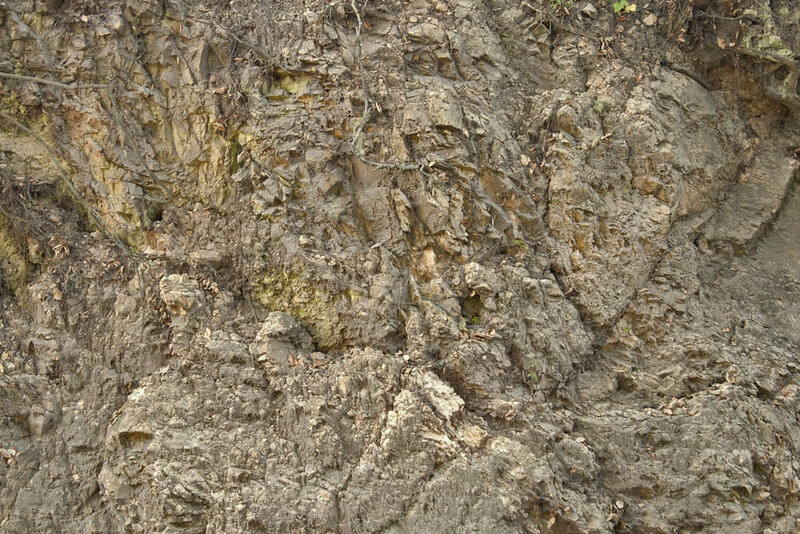 This shale has weathered into fine, pink-hued clay that combines with shards of white bedrock to provide the perfect physical soil structure for Pinot Noir. Like the soil in Burgundy’s belt of Grand Crus, Horseshoe’s topsoil averages about 20 inches deep before the vine roots must begin to penetrate the fractured bedrock in search of water and nutrients. This combination of clay and vigor-limiting subsoil is crucial for natural balance and intense mineral expression. Developing the vineyard at Horseshoe was much easier than Alpine. 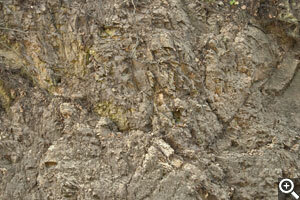 While there are some steep slopes, there are also rocky plateaus with gentler 10-15% grades. As a generalization, it is easiest to think of Horseshoe as two gently sloping plateaus, one at 1400 feet and another at 1600 feet, connected by a steep south-facing hillside. To date we have planted 17 acres of vines on the site. 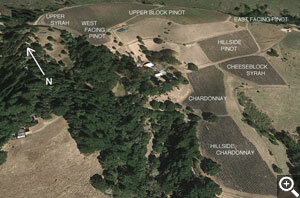 Overview of Horseshoe Vineyard’s Blocks. The Upper level of Horseshoe is divided into more than 20 different vineyard blocks facing many different directions. The majority of these blocks are planted with Pinot Noir and feature gentle eastern and southern exposures. This Upper Block Pinot is the backbone of our Horseshoe vineyard designated bottling. 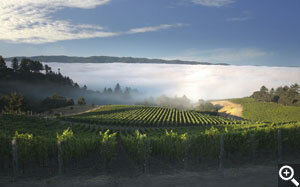 The Upper level also contains one acre of south-facing Syrah and an unusual west-facing section of Pinot Noir. While we did not initially know what to expect from this exposure, we have learned that the western aspect makes for a very late ripening, elegant Pinot. The two plateaus are connected by a steep, rocky hillside that produces some of the best wine on the site. In addition to the south-facing slopes there is a small half acre of east-facing Pinot Noir that produces a particularly distinctive wine, but to date we have not bottled it separately. A morning view down the hillside Pinot blocks and over the ‘cheeseblock’ lower Syrah and the Chardonnay blocks. 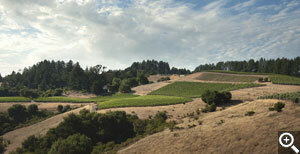 The lower level of Horseshoe is home to this site’s primary Chardonnay and Syrah plantings. In 2008, we learned the hard way that our upper section of Chardonnay is prone to frost as cool air slides down the slope and pools in this location. This crop loss delayed our debut of Horseshoe Chardonnay until the 2009 vintage. While the two blocks of Chardonnay have many similarities, the lower block features shallower soils and a steeper incline. We are carefully studying and assessing any potential qualitative differences between the two sections. Our wildly popular San Mateo blend makes its return for the first time since 2006, and we feel that the 2010 version is even better. The barrels for this excellent blend were carefully selected from our Alpine, Horseshoe and Family Farm vineyards and display key characteristics from all three. The nose offers up components common to the wines of Family Farm, including floral and rose petal notes, forest floor and bright red fruit notes. The intense fruit, spice and texture of Alpine and Horseshoe drive the palate, where the dark red and black fruit lead to a spicy and mineral infused finish. We feel the San Mateo will drink well now and improve for many years. 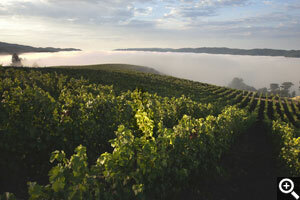 Sunrise over the upper pinot blocks frequently finds the valley below filled with fog and Horseshoe sitting just above it. Horseshoe produced another fantastic Pinot Noir in 2009, showcasing the hallmark floral notes, flinty minerality and tensile strength we’ve come to expect from the vineyard. The nose showcases the crushed violets, rose petal, spice and wet stone aromas that are typical of the site, with subtle dark fruits in the background. The palate echoes the nose, with sappy black cherry and blackberry fruit pierced with flinty minerality and lifted floral notes. Horseshoe is a study in contrasts, as it is one of our most structured pinots, with arguably the most weightless and elegant mouthfeel of the entire lineup. Although the Horseshoe Pinot will drink well with several hours of air, it needs a few years in bottle to really show its character, and it should continue to improve for at least a decade. Although Horseshoe Vineyard began producing in 2007, we’ve waited until 2009 to introduce the Chardonnay, and we think it’s a stunning debut. The differences between the Alpine and Horseshoe Chardonnay are many and consistent, providing a fascinating lesson on the primacy of site in the final character of the wines. While Alpine tends towards citrus peel fruit and saline mineral notes, the Horseshoe is dominated by floral notes. The nose tends towards jasmine, honeysuckle and bright apple fruit combined with smoky, flinty mineral elements. The flinty character carries all the way through the palate, providing backbone and a focused mineral finish. Similar to the Alpine version, we feel that the Horseshoe begins to show well after 2-3 years in bottle and will improve over the next 5-10 years. Growing Syrah is a challenge at Horseshoe, where the cool climate can extend the harvest into November. In 2009, we had the added challenge of negotiating a late season storm that dumped over 8 inches of rain on the still-ripening Syrah! Luckily good weather resumed after the rain and we were able to salvage the crop. The payoff was huge, as we think the 2009 Horseshoe could be our finest Syrah to date. Offering highly concentrated aromas of black pepper, spice, mineral earth and game, the cold climate characteristics of the variety are all on full display here. The palate shows great persistence, with elegant dark berry fruit complementing the spice and game notes. Also present on the palate are the hallmark dark floral and flinty mineral components so intrinsic to Horseshoe. Although it is approachable now, we recommend cellaring for 3-5 more years, and this wine should continue to improve for 5-10 years. As usual, all wines are offered with free ground shipping and expedited shipping is available. Additionally, we will be hosting a pickup day at our Skyline cave on Sunday, November 4th from 10AM – 3PM. If you would like to attend the pickup day, please be sure to select “Pick­­up at Winery” shipping option during checkout. We look forward to seeing you!